Are you not interested in deer hunting with urine scents? If the thought of sitting around all morning smelling urine is just not your cup of tea, there are other options out there! You can choose dirt scent spray to cover up your smell and help you have a successful hunting trip. There are many ways to get a dirt scent for your trip. The simplest way to do it is to invest in a store-bought spray. There are many options out there that mimic the smell of fresh earth that is all too familiar. If you are located in the area where you’ll be hunting, you can make a scent for yourself. All you have to do is collect aromatic plants from the area, boil them, and put the strained solution in a spray bottle. With this spray, the deer will only smell the scents that are in the area. It’s important to make sure that you spray everything you are bringing with you, as one odd smell may ruin the entire trip. When you are ready to go deer hunting in South Carolina, you can plan a visit to the Cedar Knoll Hunting Lodge. We offer excellent guided hunting trips in the Lowcountry on a private piece of land. Contact us today to learn more about available hunting dates. This entry was posted in South Carolina Deer Hunting and tagged deer hunting south carolina on June 21, 2017 by 15803827. Doe Urine – Throughout the year you can use doe urine scents to lure bucks. Typically, this urine scent lets them know that the area is safe to visit, relaxing deer as they pass by and giving you the chance to take a shot. It works best earlier in the season when bucks are still in groups and haven’t become as competitive yet. 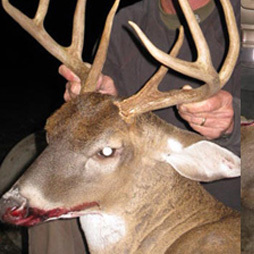 Buck Urine – When bucks are starting to get more aggressive and curious, you can start to use buck urine scents along with deep grunts and rattles to lure bucks into your area. In this case, the bucks feel challenged by this scent and is ready to search high and low to find a trespasser on his territory. Doe Estrus – This scent is best used during mating seasons. If you have started to notice bucks chasing does around your area, you can use this around your setup to cover your scent and attract bucks to your location. Many people who have used this scent at the right time have managed to get the biggest buck of their hunting career. When you want to go out hunting deer in South Carolina, you can plan a visit to the Cedar Knoll Hunting Lodge. We offer unique guided hunting trips during deer season, as well as boar and quail hunting opportunities. This entry was posted in South Carolina Deer Hunting and tagged guided hunting trips on June 7, 2017 by 15803827.